Click here to see photos from the ICCI Student Council Meeting with Board Chair Mannisto. Click here to see photos from the ICCI Student Council Presentation to the Board of Trustees. The ICCI Student Council is the student voice in the academic, cultural, and social affairs of the college. It depends heavily on energetic and interested representatives elected annually from the student body. In addition to conveying student recommendations and sentiments to the faculty, staff, and administration, the Student Council s responsible for recommending the allocating of student activity fees, shaping policies affecting student life, coordinating extracurricular activities, and chartering new clubs and organizations.The Executive Team meets regularly, but is required to have one general student wide meeting each academic quarter. The Student Council selects students to establish standing committees of the Faculty. These committees are generally involved with the development of policies that affect the students and their relationship to the faculty. The ICCI Student Council Executive Team also attends the quarterly meeting of the ICCI Board of Trustees to express concerns about student welfare and to deliver a quarterly report. As part of ICCI’s transparency initiative, minutes from student council meetings are posted on this page. 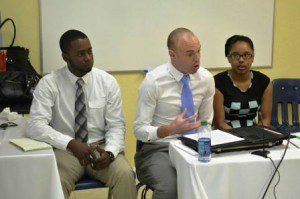 Michael Sanford – is the President for the ICCI Student Council, Michael was born in George Town, but grew up in Cayman Brac. He completed High School in 2006 and went to school overseas on an athletic scholarship to play soccer at Saint Leo University. He returned home to complete his Associate Degree in Business Administration at UCCI, before transferring to ICCI where he is currently enrolled in the Bachelors of Science in Business Administration with a Concentration in Accounting and is due to graduate this year. Upon completion of his degree, Michael will be pursuing the Certified Management Accountant (CMA) designation as well as the Certified Public Accountant (CPA) license. Michael’s goal as Student Council President is to do his best in addressing all issues and concerns within the student body. He also hopes to improve greatly the quality of learning in all degree programs at ICCI by working with the ICCI Faculty and Board of Trustee Members. Derick Johnson – is the Vice President of the 2016 Student Council Body, with a High School degree from Tucville High School in 2010 and currently completing his Bachelors of Science in Business Administration with an Accounting Concentration from the International College of the Cayman Islands with the expectation of graduating in the year 2016. He is an ambitious, dedicated and amicable individual who aspires to further his studies in the Certified Public Accountant (CPA) program in order to maintain an upward scale for his professional career advancement. 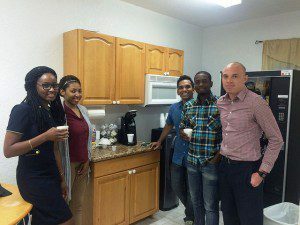 Since becoming Vice President of the Student Council of the International College of the Cayman Islands, Mr. Johnson goals are to increase the number of students attending the college, help maximize the low rate of Caymanians who have earned a college credential, and continue giving back to the community such as volunteering for Earth Day and Red Sky. Apart from his academic life, he also enjoys sports, listening to music and spending quality time with his family and friends. Felicia Bodden – is the Treasurer of the Student Council. She earned her Associates Degree in Applied Sciences in Accounting at the University College of the Cayman Islands (UCCI). Currently, she is pursuing her Bachelor’s degree in Business Administration with a concentration in Accounting. Once she has completed her Bachelor’s degree, she plans to further her education by pursing a Masters of Science degree in Accounting. By doing so, it will allow her to obtain the required credits needed to sit the Certified Public Accountant (CPA) exam. Felicia has a keen interest in building a professional career and looks at challenges to broaden her horizons. 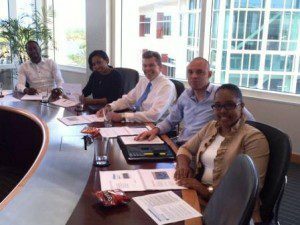 At present, she is an Accounts Assistant at Cayman Enterprise City. Shenek Conolly – is the Secretary for the Student Council, Shenek was born in George Town, but grew up in East End. She completed John Gray High School in 2009 and went to the University College of the Cayman Islands (UCCI) to complete an Associates of Arts degree in Business Administration. 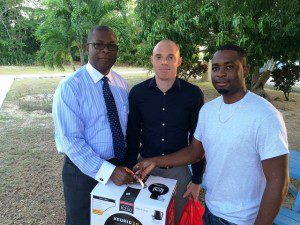 Upon her completion, she enrolled into the International College of the Cayman Islands (ICCI) Bachelors program. She is currently pursuing a Bachelor’s of Science degree in Business Administration and due to graduate in 2016. She plans to further her education by pursuing an MBA and any professional certification that can aide in becoming a highly professional business individual. Shenek’s goal as Student Council Secretary is to do her best in assisting the Vice President in addressing all issues and concerns within the student body. She also hopes to aid greatly in improving the quality of learning and overall student satisfaction at ICCI. Glennelle Miller– is the Bachelor’s Program Representative. Graduated with her Associates Degree in 2014 with Associates of Science: Business Administration. She then decided to pursue her Bachelors in Business Administration: Accounting Concentration in which she will complete in fall 2016. Afterward, she has decided to sit the CPA Exam, and after which she will then pursue her Master’s in another nature of business.She desires, and is aiming to make herself highly marketable and competitive in today’s job market. 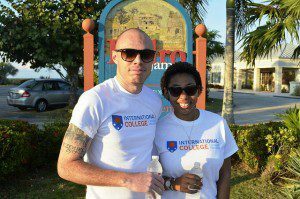 Glennelle wants to see ICCI come to the full potential in which is truly contains, as well as help the student body enjoy their academic career at The International College of the Cayman Islands. Melody Martin– Graduate Program Representative for the ICCI Student Council. Melody earned her bachelor’s degree in Human Resource Management at the University of Tennessee at Chattanooga. Presently, she is enrolled at ICCI to obtain a Masters of Science in Human Resource Management while working full time as an HR Executive at Maples and Calder. Upon completion of her degree, Melody has aspirations of applying her education and experience to excel in the areas of training and development. Her hopes are to one-day partner with the Department of Education to implement programs and initiatives that can increase employment opportunities and career planning for all Caymanians. Jose Ardila – is the Community Service & Health Awareness Coordinator, a newly created role within the ICCI Student Council. Jose graduated from John Gray High School in 2011 and joined ICCI as an Associate student in September 2011. After a stint of studying in England, Jose decided to return home and complete his undergraduate studies at ICCI. He is currently studying towards a Bachelors of Science in Liberal Studies. His college courses will finish June 2017. As the Community Service & Health Awareness Coordinator, Jose is responsible for planning, promoting, and organizing community service or health related events. He hopes to assist the Student Council in creating a positive, health conscious and charitable student community.Upon completion of his bachelor’s degree, Jose plans to study a post grad qualification in Career Coaching. He desires to become a Career Counselor.